You work primarily as a photographer, but over the past few years, you’ve gradually integrated ceramics into your images and exhibitions. What initially drew you to the medium? I think for me, and probably a lot of other people, it has a lot to do with the tactility. In my case, it came partly as a response to digital photography: ceramics filled a void, in a way, by replacing aspects of the analog process that I missed. So where I used to love waiting for film to be developed to see results, now I wait for pieces to be fired; where I used to enjoy working with the chemicals and prints in the darkroom, now I physically sculpt the clay and apply the glazes. It’s really about going back to making something, rather than just prepping files and sending them out to be printed. I first became aware of your interest in the medium through your “Spring/Summer 2012” series, which incorporated self-produced pottery into still-life imagery. 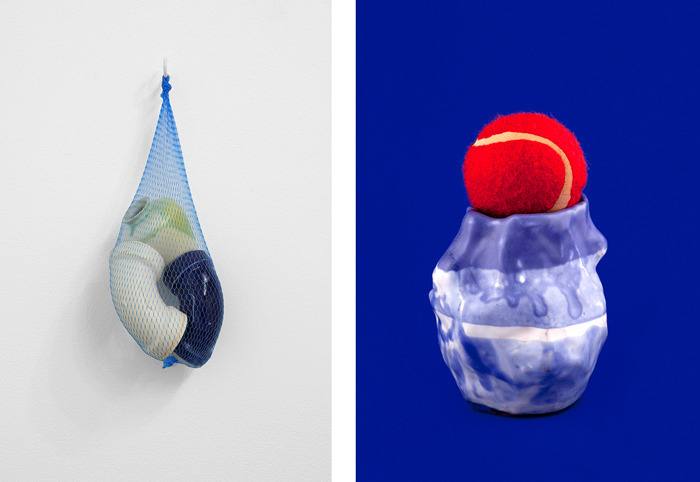 How would you say the ceramics fit into what you were doing photographically at the time? The ceramics in those photos were actually some of the first I ever made. The pieces themselves were really naive; at that early stage, it was all about learning how to shape the clay and trying out different combinations of glazes, almost like a series of tests. I didn’t really know what I was doing yet, and had no idea what the final forms or purpose would be, so things took shape pretty organically. I think that sense of experimentation is reflected in the photos themselves - for example, one of the shots has a ceramic which has been dipped in glaze but hasn’t been fired yet; another includes the wooden paddle I’d used to help shape the clay – not a ceramic piece in itself, but I thought its form was as interesting as the pieces I was producing at the time. The decision to integrate the ceramics into my photography was pretty organic as well. At that point, I was generally more concerned with the process of taking photos than with what I was actually photographing. Especially at the beginning of the project, I was shooting whatever I happened to have around, choosing and combining things intuitively, making decisions based solely on their formal qualities. So the fact that I’d started to make ceramics around the same time and had all of these new objects lying around naturally led to my including them as well. So, at that point, you were focusing exclusively on handbuilding techniques? Right. All of the pieces shown in that series were handbuilt. But I discovered slip casting pretty soon after that, which was a definite turning point. What does slip casting entail? It’s basically a casting technique that allows you to produce a large number of copies of an object using a single mold as a source. The process itself uses clay in a liquid form, which is kept that way with an additive. This liquid clay, or “slip,” is poured into a plaster mold. The plaster draws out the clay’s moisture, causing a solid wall to form; the longer you leave the slip in the mold, the thicker the wall gets. Once you’ve achieved the desired effect, you pour the remaining slip out of the mold, resulting in a hollowed-out object. You can then repeat the process as many times as desired. It’s been used to mass-produce commercial ceramics since the late 1700s - it was a huge part of the industrial revolution - and still dominates today: from plumbing materials to mugs and figurines, pretty much all of the mass-produced ceramic items you encounter are produced this way. Discovering slip casting was a really important moment in my practice. I really don’t think I would be as interested in exhibiting the ceramic work otherwise, especially as works in their own right. I still love building by hand and throwing, but I don’t think I would ever include that kind of work in my shows. I just don’t think it would fit conceptually. Well, it definitely seems more in keeping with your broader practice, which is so much about the tension between unique design and mass production. Yes! This idea of seriality, of reproducing and reusing forms, is something I think about a lot. I definitely see the use of casting as being in line with photography, with the mold functioning like a film negative - the trace of an original, “authentic” object from which many copies can be made. I’ve explored that idea in a few different ways. For example, in my current show, “Recent Advancements,” I’ve re-used some of the same forms that were in my show at Clint Roenisch last year. I also repeat a number of newer forms within the show, only with different finishes. It’s been interesting to see how, with different glazing treatments, you can change an item’s appearance so much that it’s no longer recognizable as the same form. I’ve also been making pieces cast from mass-produced forms like Powerade bottles. I’m really interested in the fact that so many of the mass-produced objects we see today were conceived as digital files which were then printed three-dimensionally – that oftentimes, the “original” never existed as a physical object prior to being copied. The same is increasingly true with slip-cast ceramic products, where 3-D modeling and printing technologies preclude the need for a physical original to cast from. On one hand, I feel like these forms, while still recognizable as products, gain a kind of classical beauty once translated to ceramics. You can begin to look at them for their aesthetic value rather than simply as commercial vehicles. At the same time, though, the casting process inevitably changes the forms in certain ways. With the Powerade bottle, for example, the liquid that had given the form its electric color and willfully artificial quality is replaced with an opaque, earth-toned, semi-gloss surface; the edges and recesses are softened; the overall size shrinks close to 20%. So the final result reads almost like a caricature of the original, with certain elements exaggerated, others reduced. The thing is, there’s no real function to the specific form of a Powerade bottle beyond ensuring brand recognition. What I find interesting about it, though, is that the same has been true of vessels throughout history: when you look back, you see that each region had its own unique aesthetic, its own take on a basic form. So on one level, working this way is about pointing to this contemporary product as an update of a traditional genre. But to then subject this form, which is so precisely designed and fabricated, to this manual casting process using traditional materials – it seemed to add an interesting layer to the conversation. Where did you learn these various techniques? Mostly in school. I joined a ceramics club first, then took a formal intro class, and eventually signed up for a slip casting class, which changed everything. Now that I’m out of school, I go to an open studio/class at the Boys and Girls Club. Those classes always bring out a pretty diverse group of people, which is great, although it’s not really anyone I can talk to about art. You mostly hear comments like, “I like that,” “That’s cute,” and so on. But it’s actually a great environment to make things in because of that. It allows you set aside broader concepts for a minute and focus instead on simply making the work. Because the process with ceramics can be so laborious, you come to think of things in the studio fairly literally – you have a preconceived sense of what the piece is going to be used for, how you’re going to produce the work, what glaze you’re thinking of using, and so on. That’s very different from how I approach photography, where my process might be technically precise in the setup but is much more quick and intuitive once I start actually building and shooting the sculptures. Personally, I prefer that pace, because I’ve found that if a work involves too much time or labor, my mind can begin to wander; I start asking myself those nagging “big picture” questions about the role of the artist and the value of art, and often end up second-guessing the work as a result. So working at the Boys and Girls club, this sort of non-art zone where people are productive while casually talking about their jobs and kids and recipes for French Onion soup, I can keep those thoughts in check and focus not on making art, but on producing an object. Questions of conceptual viability can wait until after it’s finished, when I’ve taken it back to my studio or gallery. So the lack of criticality is actually really important – it helps to keep me productive. It’s funny, though, because I feel like it’s precisely how many of us have been responding to the ceramics we’re seeing in galleries: whether or not we like the work intuitively, we’re rarely able to qualify those judgments beyond superficialities. I'm sure part of that has to do with education - few people coming out of an MFA program have been afforded either the studio experience or historical context to inform such readings - but I wonder if it's a matter of attitude as well? Well, it could just be that different audiences have different concerns. I’ve found that most ceramicists speak very literally about the medium; they’re usually more interested in the technical aspects of the process than anything else. But with art audiences, who maybe aren’t so familiar with the techniques involved, it’s harder to talk about ceramics beyond a surface level. Of course, I’m sure not everyone is so articulate in their responses to the paintings and sculptures they see in galleries, either. In my own experience, it seems like when you overhear people’s responses, it’s often either a basic formal conversation (“I like the colors”) or a monetized response (“Can you believe how much this costs?”) or whatever. Very true. Actually, along those lines: I remember at one point, as we were discussing the “Spring/Summer” images, you mentioned that you’d enjoyed adopting the Uline aesthetic because it allowed people to relate to the work without necessarily grasping the larger conceptual framework. Is the same true for the ceramic pieces? 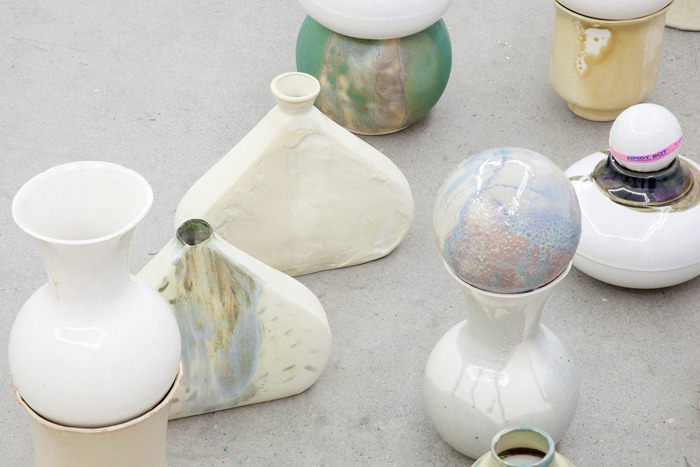 Is the familiar, unassuming nature of “craft” mediums part of their appeal? Definitely. My hope is that the forms themselves – whether they’re abstract, traditional, or simply recognizable, like the Powerade bottle – are interesting enough that even if a viewer doesn’t understand how they fit into my broader practice, he or she can still get something out of the experience. It’s the same with “Spring/Summer”: I’m sure some people walked away from those images saying, “That photo had a nice background color,” or “That’s a funny sculpture,” and didn’t think anything beyond that, which is fine. It all depends on your level of familiarity with the artist and content, which is something I want the work to be able to accommodate. I will say, though, that I hope people aren’t judging my ceramic work based on technical ability, because although I’ve been doing this long enough not to be considered a beginner, my skills definitely aren’t advanced. What you see is the result of sincere effort. But while I am interested in improving my skills, the truth is that when it comes to my work, the use of ceramics really is a means of reinforcing a particular idea. That’s why I think it’s important that the work be read as art rather than craft, which means showing it in the right context (i.e., an art gallery instead of a craft fair) and using particular means of installation. 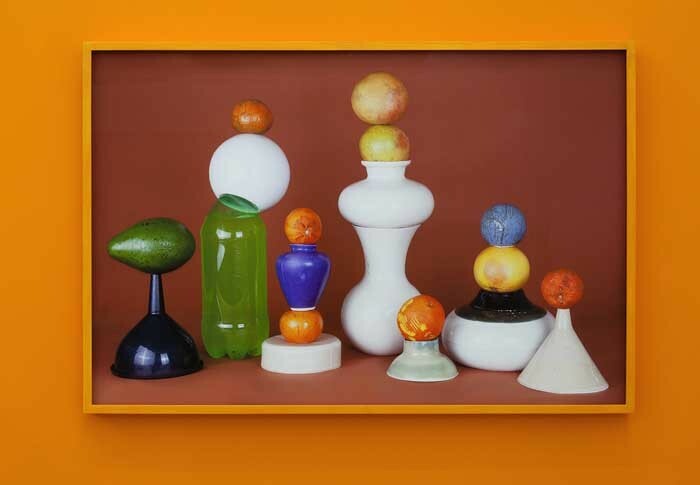 Speaking of presentation strategies, “Recent Advancements” includes a selection of ceramic objects installed in brightly colored shelving units. What led you to that mode of display? 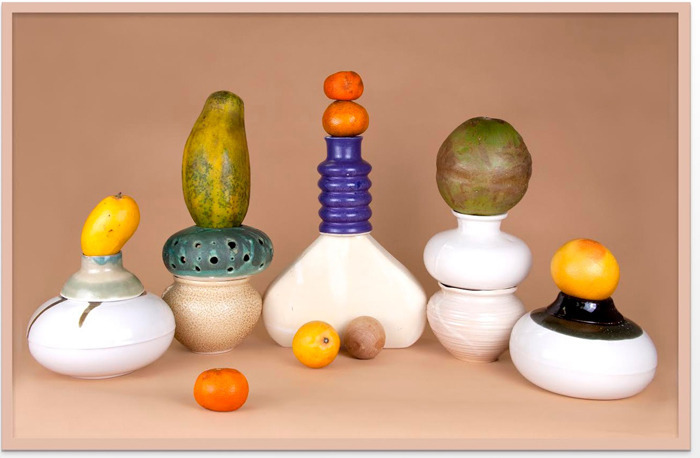 I knew first that I wanted to have a mix of forms – when you see the pieces, some are easily identifiable as vessels, while others are totally abstract. I also knew I wanted the pieces to take on the same color as their shelves, which meant trying out a variety of glazing techniques in order to achieve a sort of muted effect. Ultimately, though, I want the installation to read somewhat museologically, as if the pieces were anonymous remnants found during the renovation of the building or something. I tried to present it in a way that lets you see the work with a sense of removal, where you’re imagining what they might have been used for, with no reference point beyond the objects themselves. A future archaeology, I guess you could say. It’s really the same approach I’ve been taking in my photography, where I’m trying to shoot objects in a neutral, ambiguous way, with no suggestion of their original, intended function. In both cases, that ambiguity allows the work to slide into different contexts and take on more potential meanings. I found the abstract pieces in the show particularly interesting. How did you arrive at those forms? It’s actually a funny story. This past summer, I was searching online and found a landlord in town trying to get rid of this huge collection of plaster molds. A previous tenant had opened one of those “paint it yourself” pottery shops, but once it went out of business, she had trouble unloading the hundreds of molds she’d purchased, and eventually just left them when she moved. I went over and found that the building’s basement was literally filled with these molds; I ended up taking about thirty of them back to my studio, where I combined them in different ways. So a lot of the forms in the show came from there, while others I simply decided to make and cast myself. What was interesting about working that way, though, was that I was never entirely sure what the final forms would be until I poured them. I’d imagine that element of chance would be appealing, given how technically precise your approach to photography’s become in recent years. Definitely! Chance was something I loved about analog photography, but it isn’t as present in my digital practice. My recent photo work is about adopting the methods and appearance of straight commercial photography, which can be pretty exacting, and when you’re trying to achieve such accurate and consistent results, chance just becomes another word for stress. But with ceramics, I’ve found that even when you’re trying to make precise reproductions of form, there are always going to be variations in the results. It ends up being more about approximating an original than actually recreating it, which is something I’ve really tried to embrace in my work. 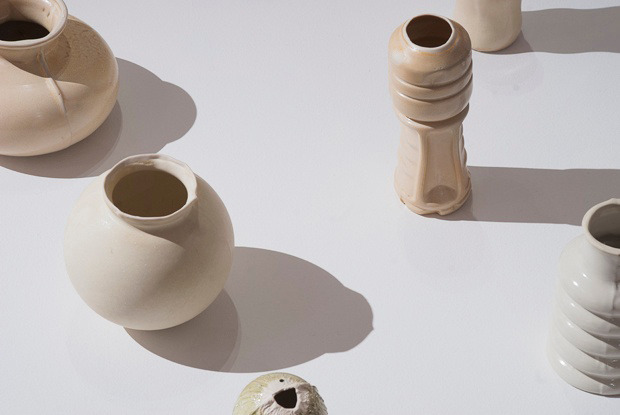 So as you further integrate the medium into your practice, are there any other ceramicists – contemporary or otherwise – influencing your approach? To be honest, I’m not keeping up with other ceramicists so much. There are a few people I’ve been excited about lately - Naomi Yasui is making great work, I really enjoy Nick Mauss’ painted ceramic panels, and I would love to get a mold-making lesson from Mattias Merkel Hess - but I’m generally less interested in particular artists or pieces than with how the work is presented and documented. A lot of the time, I’m more drawn to a photo of something than the actual object itself, which has definitely informed how I approach shooting sculptures. With documentation, it’s really more about the overall composition than just the work being pictured; I often feel like the real work is the photograph rather than the object being shown. 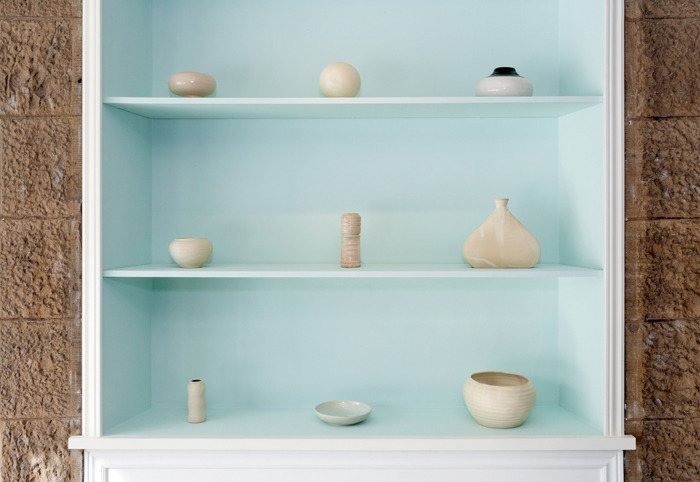 So when I’m looking at ceramics in books or online, I’m actually paying more attention to the photographers' choices than to the ceramicists’, which I think comes through in how I present my work in exhibitions. On one hand, I just think it’s important to acknowledge that these conventions exist – that, however common or subtle, they do play an active role in how we judge the objects in question. But for me, it also reflects the fact that different audiences will end up responding to different aspects of the presentation. Coming from the perspective of a photographer, I’m maybe more sensitive to the nuances of documentation imagery than other people; what I might consider a technically poor image might be perfectly acceptable to a potter. But, of course, the same could be true of a ceramicist looking at my clay works, which, as I said, aren’t necessarily about technical skill. So ultimately, we’re talking about photography and sculpture conversations meeting somewhere in the middle, adopting each other as a means to an end, and I think that’s an idea that really goes to the heart of my practice.